Tuesday was practice day at The LPGA Volvik Championship at Travis Pointe in Ann Arbor. From a fan’s point of view, not a lot happens on practice rounds. Players are trying out the course, playing balls from a variety of positions, and just generally getting a feel of the course. By the time I arrived after work, most of the day was done. I did, however, spot Cheyenne Woods. Between last week’s media day and today, a lot of tents had been constructed, concession stands were in operation and a few merchants were open. 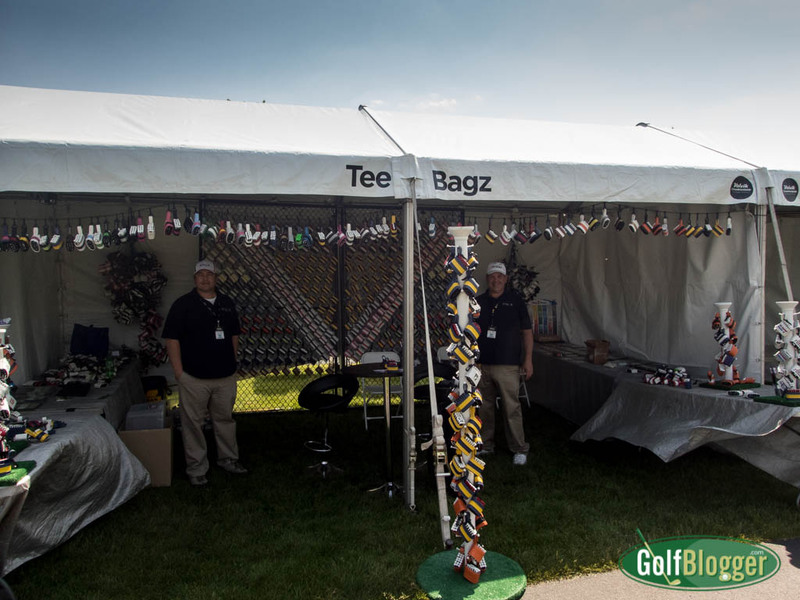 One was Tee Bagz, a Michigan company that makes some very cool tee holders to hang on your bag. Tee Bagz will offer orange Chad Tough tee holder as one of the premiums for the Orange Out For Chad Tough promotion on Saturday. I ran into Travis Pointe PGA Professional Mike Areddy near the putting green and had a brief conversation. He said that — if the weather holds up — he wants to revise his initial prediction of 16-under for the winner. The fairways are running fast, he said, and the pros are getting an additional twenty to thirty yards in run off the tees. That should translate to another couple of shots under par. Later on Tuesday, Belen Mozo and Pernilla Lindberg gave clinics at Miles of Golf, just a couple of blocks from GolfBlogger World Headquarters. I wasn’t able to attend, but a couple of hours later, my instructor in a TPI class I’m taking told us about Mozo’s travel exercise routines using stretch bands. I’m looking forward to the beginning of competition on Thursday.